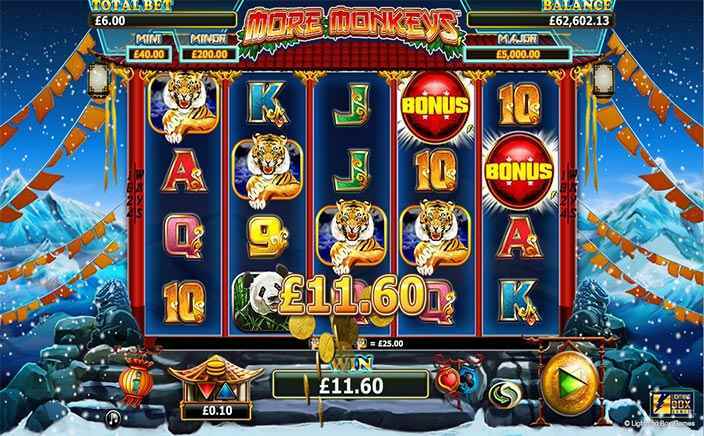 If you love the experience of the serene beauty of the Himalayas that can heal all your senses then Stellar Jackpots with More Monkeys slots game is the one you should consider playing. It is themed on Himalayan mountains and the majestic beauty surrounding them. You can listen to calm but very intensely effective sounds of a bamboo instrument and giant bell that creates a boom sound. This 5 reel, 3-row offers 1024 possible ways of winning and the number 1024 can be seen on the either side of the red game frame. The betting windows are pretty small in this game with the minimum being 60p and a maximum of £75. The proud developer of Stellar Jackpots with More Monkeys slots is NYX (Lightning Box) gaming company that has over 2 decades of experience in creating mathematically precise casino games online. They are a team of professional mathematicians and developers combined together to help gamblers try their luck and win some big money. Symbols of Stellar Jackpots with More Monkeys slots consist of a tiger, panda and Koi carp fish. Tiger symbols are of the highest value with 5 of it on a row winning you 1000 times the stake. The monkey king and bonus red symbol are the special features symbols that represent wild and scatter respectively. What makes this further unique is the jackpot wins of mini, minor and major and this works to make you filthy rich. If your bet is 60p then in the jackpot you may win £20, £100 or £2500 but if your bet is for £75 then you can win £500, £2500 or £62,500 depending on your luck in the jackpot level. The possibility of such a huge win is what makes this slots game very unique and one of a kind. ● Wild & Scatter: Wild can only land on reels 2 & 4 and substitutes for all but the scatter symbol. Scatter gets you free wins when three or more symbols land during a spin. You can win 7, 10 or 20 spins depending on the number of scatter symbols. ● How Jackpot Works: The jackpot in Stellar Jackpots with More Monkeys slots gets unlocked only when you keep raising your bet money over a number of spins. When this activates you get into jackpot level through an interstellar travel. There you have 6 levels to play and is based on your predictions. You have to choose your target in each level and you move up when you get maximum up arrows. When you finish the 6th level you play a jackpot and between mini, minor and major whichever you get the most is your win. 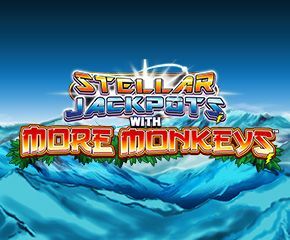 Stellar Jackpots with More Monkeys slots is a game with an appealing graphics of stunning view of Himalayan mountain range. With 1024 different possibilities and a chance to instantly win huge jackpot money, this slots game is attracting millions of gamblers across the world.